The Battle of Cawsand Bay – The story of the only Luftwaffe Tip and Run raid on Plymouth Sound. This unusual painting was originally designed as a front and rear book cover for author David J.B. Smith. Measuring 53 x 81 cm (21” x 32”), oils, available for exhibition, (sold). Painted in 2014 as a book cover for the author David J.B. Smith who wrote on the 04 March 2014 “The painting looks absolutely fantastic with all the detail picked out“. Now (15.09.2018) part of a video. A good video, gripping, short n sweet, to the point. The Battle of Cawsand Bay; can you guess how it ends? I first saw this on Twitter, a lovely surprise, the new video by author David J B Smith, well done David J B Smith and team. I knew it was coming, David had asked to use the painting in the video. I feel privileged to know my name is added to a part of #Plymouthistory. You to can make your mark, add your name to history, by commissioning or sponsoring one of my paintings, or longer term, become a patron, ask for details by phoning or email. This is a good example of my painting enhancing a story. This painting neatly puts numerous scattered pieces of film into the context of the day, place, hour, minute of what actually happened. It was a pleasure to cooperate with you David J B Smith to produce ‘our’ painting summarising this battle. I feel privileged to have contributed to this story, illustrating this piece of #Plymouthhistory. Now I’ll have to update my web site page and change the painting title, a small price to pay for being part of the story ! The design is mine, most of the information supplied by Dave Smith as was the historical information in the text that follows on here. David and I worked closely together to ensure the details are as historically accurate as the most detailed research can produce. As you can see, Dave is a very good researcher, his books are lively reads, recommended. 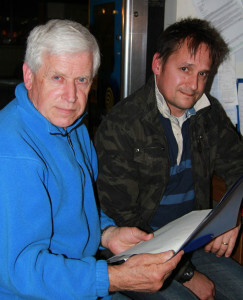 David Smith’s previous book ‘Being Silent They a Speak‘ became an Amazon best seller. Looking for the new masters of the 21 st century, the very best in modern painting investments? May 12 1942 was a calm hazy lazy day typical of Plymouth in mid May, the gorse in blossom, the air sweetly scented by the ocean. 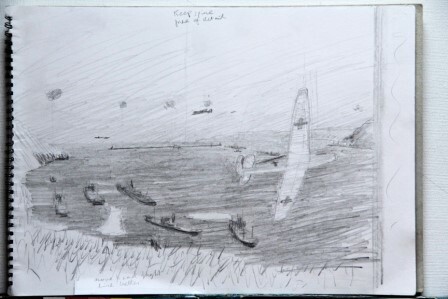 At approximately 12.50 Plymouth Sound erupted to the roar of engines and naval gunfire. You too could become one of the distinctive few who own an original Frickers painting? It may be easier than you think, affordable too, talking is free and fun, contact us. This painting, developed from conversations, some in the King’s Arms at Oreston Quay, followed by sketches and was specifically designed to become a book cover. At the time of the attack the land defences were caught completely by surprise. Unfortunately for the attackers, H. M. Ships Wolverine, Brockelsby and Cleveland were putting to sea. Wolverine and Brockelsby promptly engages the attacking Me 109’s. I was able to visit the location several times and discuss the action at length and in detail with author David J B Smith, mostly in the congenial “Kings Arms” at nearby Oreston. 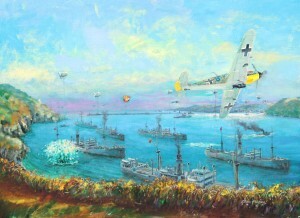 In this painting of Plymouth Sound you can see a typical convoy in the bay under Jennycliff . 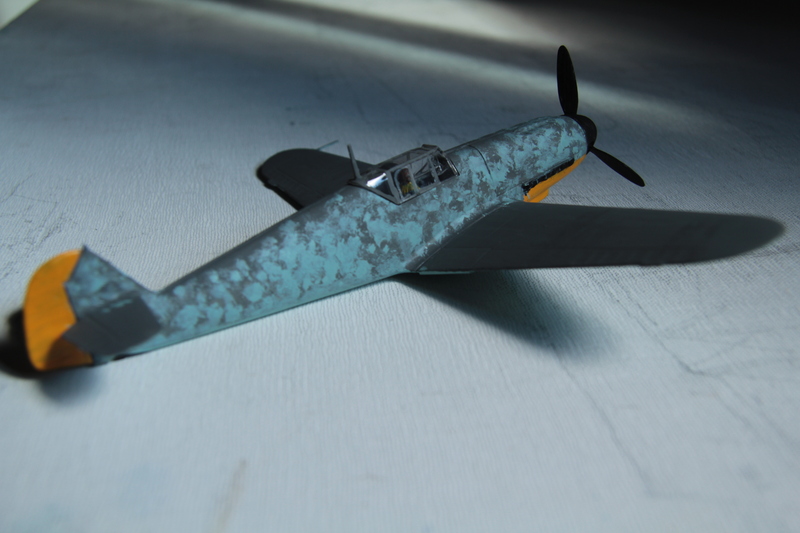 It was the target of the 6 Messerschmidt Me 109’s. 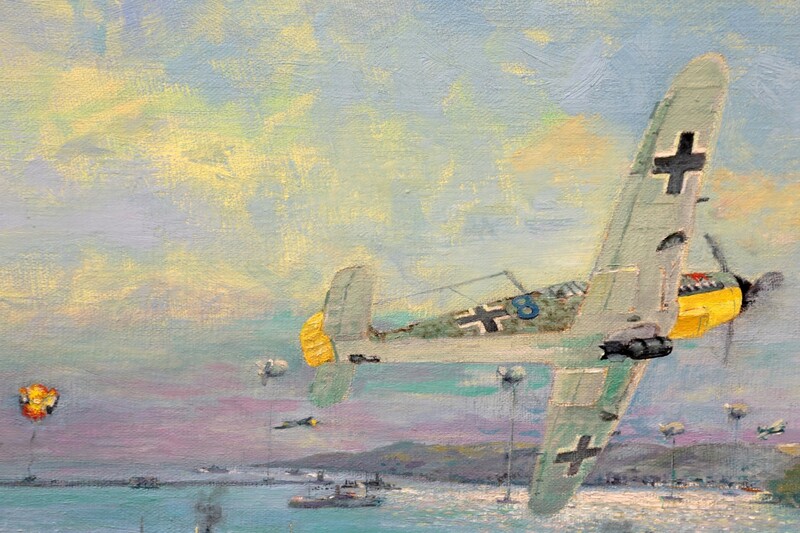 There is a considerable amount of other historical detail shown in this painting, for example over the distant Cawsand bay, a small detail is a Walrus flying boat (they were based at RAF Mount Batten, Plymouth) making a hasty turn away from the Me 109’s. On the subject of Me 109’s, David found and I built an exact model of our aircraft as an aid to perspective. All was as usual meticulously researched, in this case with my supervising the excellent Mr. David J B Smith. The aircraft shown are detailed right down to the correct markings as flown that day. An interesting detail, on the tail fin one can see marked, ships claimed sunk. This is odd because the pilot of ‘8’ was on his first combat mission. The explanation is the squadron considered any ship sunk a team effort so all aircraft in the squadron were marked accordingly. Eye witness reports mention the small convoy at anchor, stoped over in Plymouth Sound on route from Wales to Portsmouth. We established the convoy which had anchored for a few hours in Jennycliff bay was made up of 7 merchant vessels, 1 of the 7 was as shown moored at Echo Buoy. Eventually we found the names of all the merchant ships. There was no surviving ‘official’ record. The vessels would have had there names painted out and been typical merchant ships of that period. The guard ship was HMS Wolverine. Plymouth defenses included booms stretched from both ends of the Breakwater to Fort Picklecombe and Bovisand Fort respectively, the sharp eyed will notice a boom vessel at work closing the western boom as three warships leave for exercises. The attacking German aircraft are known to have attacked in line astern in pairs, been at about 1/2 a kilometre apart, this for mutual protection and so as not to interfere with each other’s attacks. We know one pealed off to attack Wolverine. Sinking British destroyers was a Luftwaffe priority, hence some confusion in official reports re the number of Me 109’s that attacked the Plymouth Sound shipping. Documents, rare, raw reports related to the attack by 6 ME 109 bf’s, confirm one damaged by naval gunfire and a second was shot down while attacking shipping in Plymouth Sound. The Wolverine report is dated the 16th, 1942. The German attack was a nasty surprise. The HMS Wolverine report confirms the lack of warning and speed of attack, the ground defenses did not engage the aircraft, it was all over to quickly for them to react. The account from the Plymouth Command War Diary from that day. 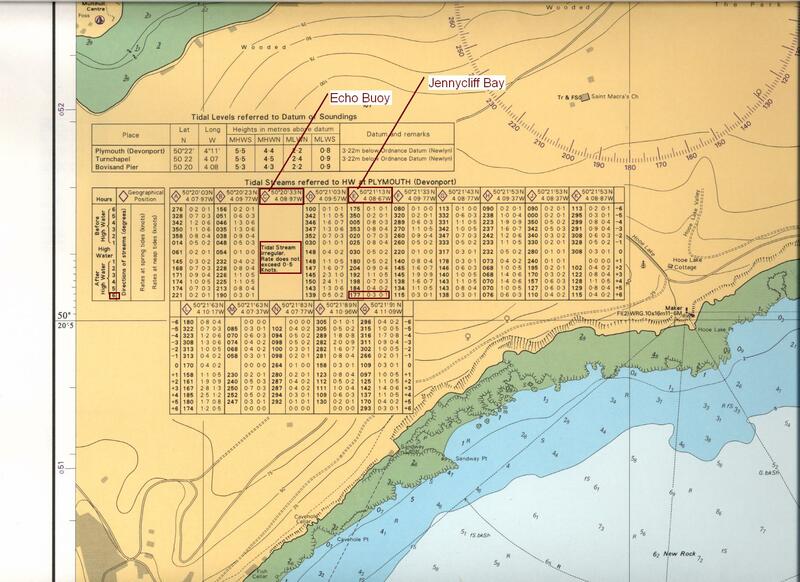 It describes vessels anchored in the Sound & Jenny Cliff bay at around the same time. 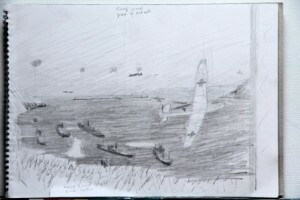 The account by the RAAF is more detailed and mentions a burning barrage balloon attached to the centre of the Breakwater, as shown in this painting. HMS Wolverine was outside the western entrance in front of the other two warships when the attack started. I checked out the dazzle camouflage scheme used at that time by the Royal Navy at that time in that theater so we know that is ‘spot on’. Two Bf 109’s peeled off to attack Wolverine. The German Bf 109 pilots flew in a ‘Schwarm’ of 6 aircraft thus each had his own wing man. They flew in groups of two, close together until the moment of attack. These pairs of aircraft were called a ‘Rotte’. The damage report for HMS Wolverine is from my source at British National Archives. In the report it goes over the attack in great detail with additional subject matter we did not know about before. The report by Wolverine’s Captain confirms there were 6 Me 109’s. The aircraft all approached from the east. They machine gunned and dropped bombs just missing a vessel at Echo Buoy. It confirms Wolverine was outside the western entrance when the attack happened. She was the furthest ship out. Followed by HMS Cleveland & then HMS Brockelsby. It also says & is confirmed by other reports that a second aircraft was damaged as it departed, seen to ‘wobble’. German records confirm two aircraft failed to return. We have the barrage balloons on the Break Water, which I believe are correct, the report says that a ‘waterborne barrage balloon’ was shot down into the sea. Notice the barrage balloons and their barges. Balloons known as barrage balloons were used extensively by the British, to deter low flying aircraft including in most parts of Plymouth waters. Old wooden schooners were often used for the duty which left those formally elegant sailing ships, ruined by the end of the war. Few ever sailed again after the war. Many a fine old vessel was ruined in this way then abandoned to rot in a creek after the war. The report of the attack specifically aimed at HMS Wolverine estimated the bombs used were no more than 250 lbs in weight. This shows us that each aircraft was carrying 4 of the smaller SC 50 bombs. This would mean more bomb splashes. Our initial thoughts of each aircraft carrying a single SC 250 (550 kg) bomb was incorrect. Our aircraft could still have had bombs on her belly as she turned away to head out to sea again. The report also says that two bombs missed and exploded astern of Wolverine. Another bounced of HMS Wolverine’s deck killing one sailor and that it exploded fifteen yards off her starboard side about midships damaging HMS Wolverine. David found photographs of a Bf 109 F4/B aircraft showing a plane showing us the colours of the squadron. We know our aircraft was No 8. The pilot, a young man on his first combat mission had been buried in May 1942 with full military honours. In 2014 the Bf 109 aircraft wreck including it’s engine was found by divers in Cawsand Bay. The definitive aircraft livery: note the yellow under the nose and the yellow tail rudder with sunk ship ‘kill markings’ on. 10/JG2 where a fighter bomber unit. They flew in ‘Schwarms’ in groups of 2 or 4. Group 10/JG2 was specifically tasked with attacking shipping. All the squadron shared the logo’s that signified ships sunk by the group. Thus all the aircraft in this 10/JG2 section shared the same tail ‘kill’ markings. They routinely bombed and strafed targets then left, hit and run. Because of this it was hard to attribute a certain hit to a specific pilot, so the group all displayed the same kill markings. If they were ‘only’ a fighter unit they would be in a specific dog fight and have had individual ‘kill’ markings. A tiny detail, note the red fox on the nose, the squadron ‘symbol’. David found two original WW2 photos of the same A/C type from 10/JG2 so could write confidently, “These colours and markings are definitely the Bf 109’s which attack our convoy in Jennycliff Bay 1942“. At my request David J B Smith also found photos of the bombs and how they were attached to the aircraft. More fine detail, note, in flight the tail rudder for a port hand turn as per our BF 109 should be to the left. On the port & stb BF 109 wings are control surfaces known as ailerons (outer wing flaps). When you bank an Me 109 to the left (Port), your left wing aileron is up and the right wing aileron is down. The number in blue, 8 on our Bf 109 is correct. David found “3 cracking photos of the SC 250 bomb” the aircraft carried. He also established “all of the 6 Bf 109’s were only carrying one SC 250 kg bomb each“. David “also found out that our Bf 109 dropped his bomb after his final turn whilst on his way out. This would mean he would still have the bomb showing as in this painting as he turns“. Thus the bombs shown to have fallen in my painting, among the convoy would have been from the previous attacking aircraft. We had to confirm the height, spring or neap, the strength and direction of the tides because in Plymouth Sound the currents change frequently and are very complex. 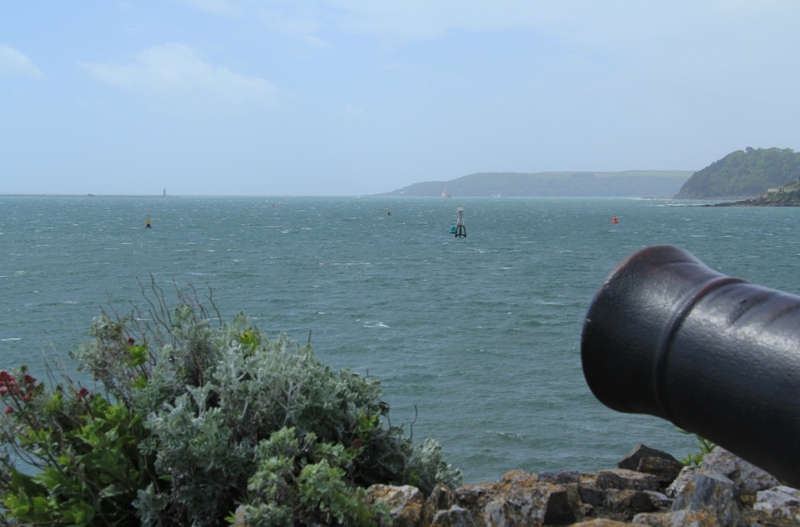 We were able to confirm the position on Echo Buoy in Plymouth Sound. It was in the same location in 1942. as today. 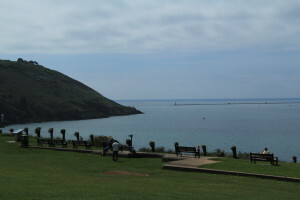 Eastern entrance to Plymouth Sound seen from Jennycliff. The tide graph shows the tide was ebbing, low water was at 14:00 ish. It was a neap tide, not a spring tide. We needed to know because it affects the the direction the ships would be lying and how much of the Breakwater would be showing. Eddys etc do effect small craft but not warships or merchantmen. The Admiralty buoy ‘Echo Buoy’ mentioned in relation to the convoy is the buoy nearest to Plymouth out of the 3 buoys immediately North of The Breakwater Charlie, Delta & Echo. E Bouy is virtually in the middle of the sound. My own Admiralty Chart of Plymouth Sound was also useful. Looking for the new masters of the 21 st century, the very best in modern painting investments? You have found it here.